This satisfying breakfast recipe is perfect to make for weekend guests. Assemble and refrigerate the casserole the night before, and just pop it in the oven the next morning. Look for turkey sausage near other breakfast-style sausage in the frozen foods section. This dish has fewer than 20g of total carbs--about half of what you'll find in classic bread-based casseroles. Greek yogurt, eggs, and cheese pack a mighty protein punch, while a touch of bacon seasons to perfection. This stand alone breakfast dish is an upgrade from the usual breakfast casserole. Baking eggs in brioche and heavy cream allows for perfectly set, soft, and runny eggs. Fresh herbs and rich egg and meaty sausage flavors round out this bake and give it irresistable texture. This overnight casserole saves you the trouble of standing over a griddle flipping individual slices of French toast. If using a fresh baguette, cut it up the day before, and let it sit in the bag overnight to become slightly stale—that'll help prevent sogginess when the casserole is baked. Thaw the artichoke hearts according to microwave directions, or in the refrigerator for 2 hours. You can also place artichoke hearts in the baking dish and bake at 375° until thawed, then remove from the pan and continue the recipe. This casserole is rich, delicious, and worthy of a special occasion breakfast. Gruyère cheese browns beautifully and adds a nutty flavor to the dish. You can substitute Swiss cheese if you prefer. A feast for the eyes as well as the appetite, this french toast creation is at the top of its game. Use in-season berries for a delectable morning feast. That down-home flavor comes together right here in the baking dish. This casserole makes the perfect accompaniment to any breakfast or brunch spread. If one piece of French toast isn't enough (and let's be honest, it never is! ), then we've got the perfect dish for you: a casserole filled with French toast. This dish combines the tangy flavor of sourdough French bread with sweet, citrusy orange marmalade and crunchy walnuts. Orange rind-infused syrup and a splash of orange juice punch up the flavor even more. Combine frozen hash brown potatoes with sausage, eggs, and cheese for a hearty, 5-star-rated breakfast or brunch casserole that can be prepped ahead and baked the next morning. Sauté one large onion and one bell pepper in the pork drippings for extra flavor and color. Tip from the recipe developer: To make mini frittatas, cook in 6-inch cast-iron skillets for 30 minutes at 375. Top with sliced avocados, pico de gallo, and a dollop of sour cream and sprinkle with green onions. When you're looking for a breakfast that is both elegant and easy this holiday season, our crowd-pleasing casserole is just the ticket. This multilayered marvel is loaded with crispy potatoes, hot-smoked salmon, and a smattering of fresh herbs. Cottage cheese naturally melds into the eggs, creating pillowy lightness throughout the mixture, while goat cheese creates dense pockets of creaminess. Hot-smoked salmon, unlike cured, is fully cooked—look for it in the fish case or packaged in the meat aisle of your grocery store. 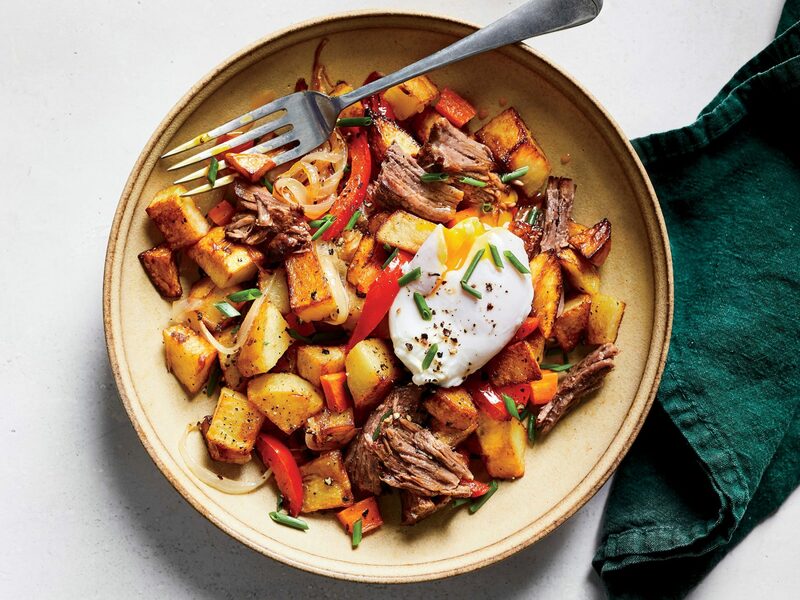 Our recipe hits all the marks for a hearty one-dish meal, with 25% fewer calories, 7g less saturated fat, and over 600mg less sodium than traditional meat-and-cheese breakfast casseroles. Use a well-seasoned cast-iron skillet for best results. Andouille sausage, two types of cheese, and a splash of hot sauce add flavor and a little kick to Sausage and Polenta Breakfast Casserole. This make-ahead breakfast casserole is perfect for holiday mornings--just cook and enjoy. The classic egg, sausage, and potato breakfast casserole combo gets a little kick from picante sauce and sour cream for a south-of-the-border brunch experience. This flavor-packed take on breakfast casserole is a great way to use up leftover Texas toast or garlic bread. Rich, indulgent, and spicy, its gooeyness is perfectly complimented by the tang from the crema, which can be found in a Latin market. Play around with frozen toast flavors to spice things up, or serve it as breakfast for dinner. If you're looking for some sophisticated ingredients for your next breakfast dish, look no further than spinach, artichoke, and gouda cheese. Mixed in with eggs, these ingredients tap into a wonderful flavor combination that can't be beaten. Oh Instant Pot, what can't you do?